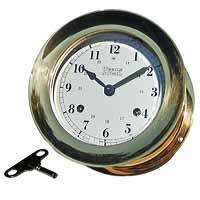 These clocks strike the ship's bell (ships clock) sequence and have polished brass cases. Matching barometers are available. Ship's Bell Strike on a Ships Clock Ship's bell (ships bell) strike is based on "watches" onboard ship of 4 hours each. A new watch starts at noon, 4 p.m., 8 p.m., midnight, 4 a.m. and 8 a.m. The end of a "watch" and start of a new watch is marked by the bell being struck 8 times. A half hour later, the bell is struck once, with an additional strike each half hour until the end of the watch. Then the cycle starts again. The bells are struck in pairs, that is, the first two bells are struck close together followed by a delay, then the next two, etc. The example below at the bottom of this page will help to understand the ship's watch. Authentic German made brass ships bell clock. 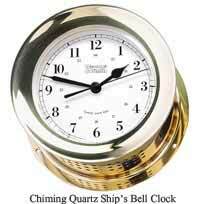 Traditional brass ship's bell striking clock with a polished brass case. The 8-day key wound movement has an 11 jewel platform escapement. The dial is white with Roman numerals and spade hands. The hinged bezel has a beveled glass lens and screw-down fastener. Fast-slow adjustment and strike-silent levers through the dial. Ship's Bell strike is only loud enough to be heard within the same room. Three Year warranty and Free Shipping. Size: 7 1/8 diameter x 4 inches deep. Weems and Plath Atlantis collection Quartz (battery powered) traditional ship's 8-bell cycle. Chimes the watch every half hour. Complete with bell silencer switch. AA battery included. Assembled in USA. Uses 100B Single base. Weight 3 lbs. 7 oz. Two year warranty and Free Shipping. Base: 5-1/2". Depth: 2-7/8" - Dial: 4". Weems and Plath Atlantis Keywound Ships Bell Clock. The keywound bell movement has been redesigned to produce a richer. louder, ship's bell chime. Its case has been created from solid, forged brass. Hand polishing and a flawless coat of lacquer adds depth and luster. The screw bezel adds the classic nautical look, yet allows easy access to the components when the unit is mounted. Each instrument is provided with complete instructions, mounting hardware and a winding key. Two year warranty and Free Shipping. 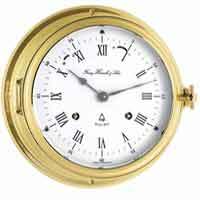 Size: Dial: 4" Base 5 1/2" Depth 2 7/8"
The Ships Clock sequence counts the four-hour watches that is still common today where one on duty for the watch would expect a duration of four hours. Each watch would begin at 12:00, 4:00 or 8 day and night. For example a watch may start at 12:00 noon, The clock will strike 4 pairs of strikes at 12:00 indicating the start of the ships watch. At 12:30 one chime plays. The bell strikes are in pairs, the clock would strike twice - pause - then add another strike. The chart below indicates each strike at every half hour.